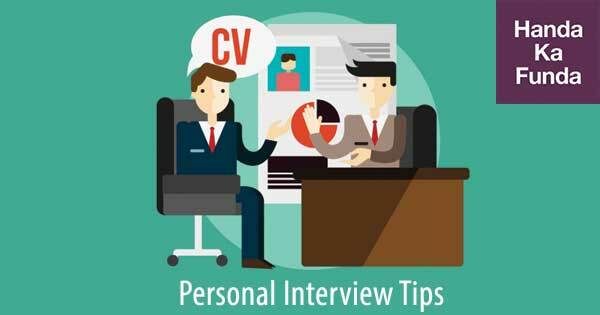 Personal Interview Tips: I must have interviewed at least a few thousand candidates in my time. Every time I feel that I have seen it all and I have met them all, a Higher Power Up There intervenes and restores my humility by presenting a sample that I have never seen before. I share with readers these samples in the (absolutely vain) hope that they will not repeat these cases, and make their own new mistakes so that my life remains exciting. I just pray that you make those new mistakes in the mock interviews and not in the actual ones! This includes slouching (or slumping, depending on the course of the interview) in the chair, shaking the legs, not making eye contact with (any or all of) the panellists, twitching the hands nervously, leaning too forward in the chair to project an image of cool casualness, constant shifting of legs (those with better GK will recall Sharon Stone in Basic Instinct), feigning shyness that borders on flirting (yes, I have also seen this! ), stroking the hair coquettishly (I have no earthly idea WHY! ), smiling suppliantly, rolling up the eyes in disapproval, having a permanent frown on the forehead, being a poor listener, not letting the panel finish, raising one’s voice over nothing, or in general, just showing anger and frustration for no apparent reason. All of these are signs of a disturbed and disturbing soul who is going to be very difficult to handle over the course of 4 semesters. These occurred despite plenty of warnings given in no uncertain words. There is a lack of knowledge, and then there is a criminal lack of knowledge. The candidate: (now he decides to make a sentence!) “Dunlop is called Dunlop because of Lord Dunlop! That the majority of the candidates are not entirely clear on why MBA is normal. That they know this and somewhere feel concerned about it is also normal. The abnormal, however, is an entirely different class. This, ironically, consists of such candidates who are usually good students, but this quality of theirs is counterproductive because they have mastered the art of scoring well in exams without having any clear goals. They are usually aware of this strength of theirs, and this awareness lends them an air of haughty disdain for almost everyone around them – including the interview panel. Here is the best. I once interviewed a case who had 99.25 percentile and had NO clue about why MBA or why any IIM. He told me that he had not ‘planned’ this (i.e. scoring so well in the CAT). In his words, it just happened. I could not resist the comeback! While it is true within the context my experience that for every one male candidate that cries during the interview there are 4 female candidates who do, the phenomenon of being on the verge of crying presents a much more balanced proportion. It is possible that during the PI, you may be reminded of a potentially disturbing detail, a painful event caused by factors that lie outside your control – such a serious illness or death in the family – and your eyes may well up in its memory. This is a natural reaction of every sensitive individual. The panel will completely understand this. This is not the type I am referring to. What I am talking about is breaking down (or being on the verge of it) because the interview is too rigorous and is exposing the candidate’s awful performances in the past, and/or the lack of preparation in the present. As I have said earlier, one must have an analytical approach to one’s failures. One must demonstrate to the panel the learnings from mistakes. That is all that matters in the present. An emotional outburst such as crying only demonstrates that the candidate not only has not learned from the past mistakes but also is unable to handle the slightest pressure, either of which is enough to confirm the rejection of one’s candidature. Sin No 8: There is No Word for This – Just…Just Do Not Do This. Ever. I would have liked to call it abject solipsism. But no, that does not cover even half of it.